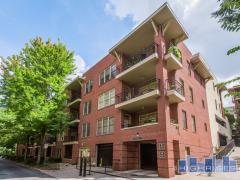 Palmer and Phelan blends Atlanta history with an amazing location near all that a modern buyer could want. This condo community is over 100 years old, but this well-maintained landmark boasts units with top-notch renovations that celebrate its heritage. Traditional charm is abundant in these units- there aren’t many places where you can soak up rays in your sunrooms and overlook the bustle of Midtown Atlanta. Have any comments or questions about Palmer & Phelan? Ask your question and/or share your thoughts about this Building.